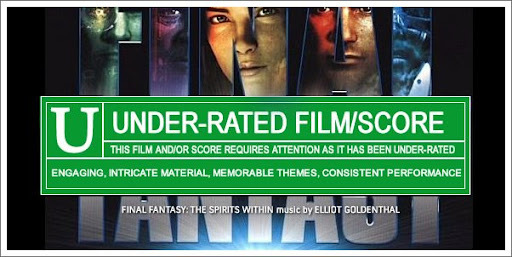 Going back to 2001, FINAL FANTASY: THE SPIRITS WITHIN was composer ELLIOT's last foray into this genre or any even remotely related (accept for S.W.A.T. perhaps)...and this to the detriment of film score fans everywhere. His work for this film continued his tendency toward the big, the bold and even the bodacious, but with balance. Goldenthal's epic work gave the groundbreaking 3D animated film a special gravitas that happens to translate into operatic-style listen on its own. Additionally, Lara Fabian's performance of the title track "The Dream Within" is equally mesmerizing and should have, at the very least, garnered an Oscar nomination. With 2009's PUBLIC ENEMIES on his plate, it's likely the community will be uttering the name of "ELLIOT GOLDENTHAL" once again. Until it's release though, let's go back eight years and re-discover this fantastic and forceful effort. This is absolutely one of Goldenthal's best scores and one of my favourite scores, period. Thanks for posting, Chris! More people need to hear the music of the genius that is Goldenthal. Bring on "Public Enemies"! !